On Tuesday, February 17th, Oregon’s design professional community will be coming together to meet with the Oregon Legislature. Typically these types of events are a chance for design professionals to talk to legislators about professional concerns. This year is a bit different. The design community is focussing on the passage of the Oregon Resilience Task Force (ORTF) recommendations. 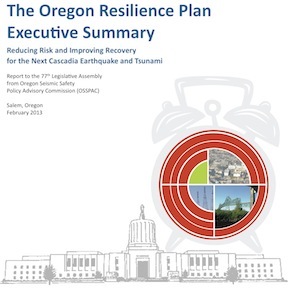 These recommendations range from establishing a Resilience Policy Advisor to the Governor, land uses changes related to tsunami’s, additional revenue for seismic upgrades for transportation, the schools, essential facilities, seismic resilience research, and seismic assessments of Oregon’s energy infrastructure. The ORTF recommendations were requested by the Legislature as a first step to to implementing the Oregon Resilience Plan (ORP), a fifty year plan to prepare Oregon for a Cascadia earthquake and tsunami. Also unusual, is the extent of the collaboration of the design professional community. The professional associations of architects, civil engineers, public works engineers, structural engineers, and planners will all be in attendance. This reflects the importance the design community attaches to resilience. It also continues the efforts of many of these same design professionals, planners, and scientists who worked pro-bono on the creation of the Oregon Resilience Plan. The ORP and this effort are unusual in one other way as well. It is one of the rare efforts to prepare for a large natural disaster before it actually occurs. We are showing others that it is possible to plan ahead. Oregon can reap the benefits of this effort in less fatalities and injuries, less damage, and less economic impact. If you are a design professional and would to join the effort, you can sign up here. Time: 8:30 am to 4:00 pm. Cost: $15.00 for breakfast and lunch.